My friend Steve tells about a strange incident. But before trying the gap-fill listening activity, make sure you know these 6 vocab items: honk, horn, paws, pesky, run across, steering wheel. When we go (1) __________ every year, we (2) __________ a lot of (3) __________ animals. 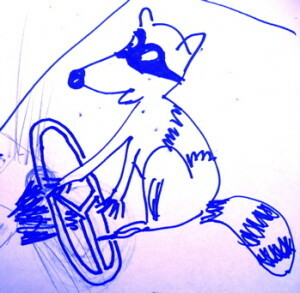 There’re a lot of (4) __________ and raccoons and (5) __________ . So what I do is I hide the dog food – we take our dog there – in the (6) __________ . So one year I put the dog food in the truck and I went to sleep, and in the middle of the night I (7) __________ the horn of the truck going on and off, and I finally (8) __________ , and I (9) __________ my flashlight in the truck. And there’s a raccoon with his (10) __________ on the (11) __________, eating the dog food and honking the (12) __________ , and I … I would’ve been (13) __________ but I was (14) __________ so I just went back to sleep. Yeah, he was (15) __________ the horn, he was honking the horn, standing up, with his hands on the steering wheel, honking the horn. Yeah.